Why Not Make Your Own Fingerstyle Guitar Tablature? 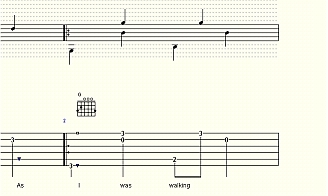 Learn How To Create Your Own Fingerstyle Guitar Tablature. Finding acoustic guitar tab for every song that you want to learn isn't always possilble. And sometimes it's only available in a book. You may not want to buy a whole book of acoustic guitar tab. We're going to take a look at how to create our own guitar tablature. There are several advantages to creating your own guitar tablature. The first one, of course, is that you'll get the tab to a song that you want to learn to play. Another big reason is that it can really help you learn the style of a musician that you admire. Say you want to learn a Blind Blake tune. The problem is, you can't find the acoustic guitar tablature for it. So you decide to create your own tablature. To do this you're going to have to listen to the song a lot. This will help you subconsiously absorb the characteristics of his playing. You'll also be listening to the song on a conscious level to figure it out. This can really help you get a deeper understanding of the guitarist's playing style. When you do begin creating fingerstyle guitar tablature, it really helps to slow the song down. How do you do that? In the old days of vinyl records, you could slow down the turntable. We would play a 45RPM record at 33 1/3 RPM. Of course, this would lower the pitch of the notes as well. Now days there's software that does that. Some, like Audacity, are free. I use a program called Transcribe! It's easy to use and is designed specifically for transcribing music and speech. They offer a free trial so that you can try it out for yourself. It makes learning fingerstyle guitar songs by ear much easier. The other piece of the puzzle is a tablature editor. I use TablEdit. I know that there are others out there, but TablEdit is pretty easy to use and gets good results. So now you have a way to slow down the recording and write down what you're hearing. Here's the process that I use when I'm transcribing a guitar recording (taking something off of a recording). First, I listen for the lowest bass note that I can find. This will tell if the guitar is tuned to standard tuning or not. After I figure out if the bass notes are tuned normally, I listen for any chords that don't sound "right". In both examples, you're playing the same guitar chord. But notice the different tonal quality of each. Combine a lower than normal bass note and a bright ringing sound on the top, and you've probably got a non-standard tuning. Once you know how the guitar is tuned, it's a matter of listening. Slow down the recording enough to figure out what's going on. Next, start writing out your own fingerstyle guitar tablature. For me, there was a little bit of a learning curve with the new programs (more so with TablEdit than Transcribe!). But, with a little practice, I started getting the acoustic guitar tab that I wanted. And learning how to do it is making me a better player. Give it a try, you might find that you like it, too.